The Bluejay is well known in the backyard birding world, and frequent visitors to any bird feeder that provides its favorite food. They love to eat seed, insects and nuts. These are medium-sized birds and larger than a typical small song bird. Bluejays can grow from 9-12 inches and are more aggressive then other species. It is not hard to spot blue and white distinctive color paterns on this bird the narrow necklace of dark color around the head and splashes of white in the wings. Bluejays are omnivore and eat variety of food according to season. These birds will love to eat peanuts, insects and even small animals. If you want to attract bluejays the best options is to install a peanut bird feeder. In winter these birds will switch to manly vegetarian diet, and will look for acorns, seed, wild berries and peanuts. When warm weather arrives Bluejays will eat small and large insects, steal small bird eggs and even hunt for mice. 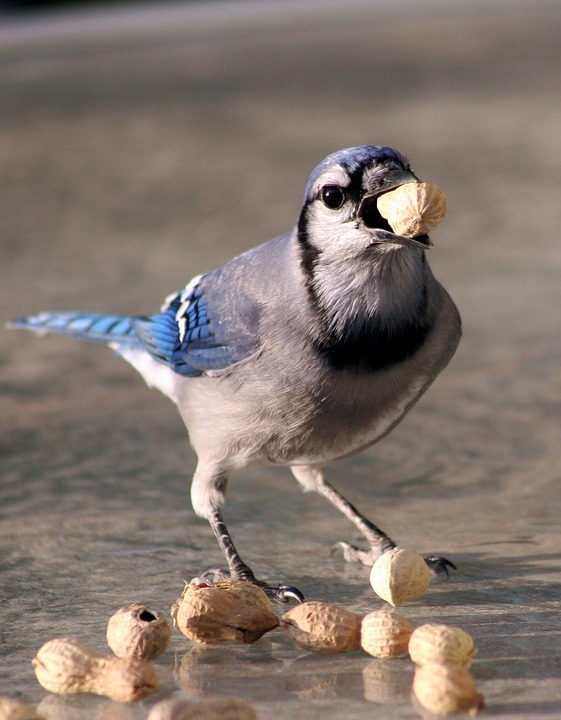 Although Bluejays are known to take eggs from other birds, only about 1% of their diet is acquired this way. Most of jays diet are plant based and can ge easily attracted by backyard birders, peanuts, sunflower seed and berries are the best way to do this. When feeding birds I like to offer food types that are preferred by each individual species. They seem to prefer peanuts and are more likely to eat them than fighting for a single seed from the sunflower feeders. You can get a tray platform feeder and fill it with peanuts or dried berries, special tube feeders designed for peanuts can also be used. Often they'll cache their food. I was watching one day as the bird came for one peanut after another from the feeder in the backyard just to hide them in my front lawn. I have to admit I stopped feeding peanuts for a few days and started placing fewer in the feeder when I started feeding again. I didn't want five pounds of peanuts in my lawn. Bluejays like to hide food for later just like chickadee and titmice. Thay can have a few hiding places where nuts are stored. In winter bluejays will come back and eat when food sources are not abundant. These bird love to visit backyards, parks and lawns to look for food, but build their nests on trees. Typical bluejay nest will be on a sturdy branch up in the tree secured from predators. Both parents are involved in nest building and will take care of the young. Nest are similar to other larger birds, and made from twigs, moss and bark. Planting oak trees are great for bluejays. If you have oak trees or woodland near your home bluejays will sure hang around. Dont worry if you dont have oaks, bluejays are not that picky and can be found where ever there is some food to find. • All trees that have nuts will attract bluejays. • Having trees around your home will provide nesting places for these bird, and they like to hide under branches. Mating season will start from March to July and this is the time bluejays will have greater needs to find food for the young. Placing bird feeders and food for them at this time will attract them even more in your backyard. Bluejays are monogamous and will mate for life, that means that if a bluejay lives near you they will often have a partner. Offering small sticks and other similar material can help them build the nest. Bluejays are good builders and will often travel long way to find the suitable material. If you have the chance to provide the sticks for them they are more likely to build the nest in the area. These birds are very sociable and often come in groups. Autumn and winter are times when they like to look for food in groups and can scare other birds from feeders. Some people see them as bullies and dont like them chasing away smaller birds, but you can solve this by placing a special peanut feeder for the jays. I recomend that you separate the bird feeders for smaller birds and bluejays, place them in the oposite corners of your backyard. Bluejays are territorial and small bird will try to stay away, so it is better to separate them in the beginning so you can enjoy all of them. Hanging tube feeder will not attract bluejays so these are beter for small birds. Remember always to place all bird feeders where birds have a clear view of their surroundings and can spot predators like cats.